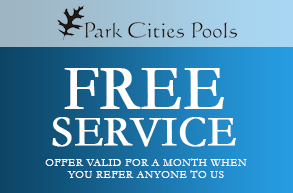 Get the peace of mind you deserve when you contact Park Cities Pools for your pool cleaning and repair needs. Our dedicated pool maintenance team takes the necessary steps to provide the best service in town. Contact us to hire our team for all your pool repair and cleaning needs. Our company is locally-based and can easily schedule your service the same day a problem arises. Additionally, we provide weekly service to keep your pool clean. Park Cities Pools is here for all your Dallas Pool Cleaning and Dallas Pool Repair needs. At Park Cities Pools, it is about quality pool cleaning service. We strive daily to provide the best pool cleaning and maintenance service for our Dallas clients. Our pool cleaning techs will arrive on the same day each week to service your pool. They will unlock and lock your gate, and take care that your dogs remain home. If equipment issues are found, the pool techs will notify our service manager, and send pictures to our repairman. Our Dallas pool cleaning techs have the experience to keep your pool nice year round. We have a dedicated Repairman and a Pool Service Manager to ensure a level of response unmatched in Dallas. Contact us to learn more about the swimming pool repair and cleaning that our pool service provides you.